CAF Constable GD, CAF Constable MT Vahak, CAF Constable Tradesman Cook, CAF Constable Tradesman Water Carrier, CAF Constable Tradesman Nai/Dog Squad, CAF Constable Tradesman Dhobi and Constable Tradesman Sweeper through special recruitment for the Districts of Bijapur, Dantewada, Bastar, Kanker, Kondagaon, Rajnandgaon, Jashpur, Korea, Surguja, Balrampur, Dhamtari, Mahasamund, Gariaband, Balod, Sukma & Narayanpur of Chhattisgarh State. Total available posts are 1786. For this Chhattisgarh Police Department Armed Forces Recruitment online application form submission starts from 26th January-2018 to 15-February-2018 till 11.59 PM. 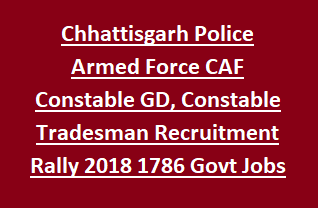 All details of Chhattisgarh Armed Forces CAF Recruitment 2018 for 1786 Constable General Duty, Constable Tradesman Govt Posts is mentioned below. For Constable General Duty: Candidates should have passed matriculation/10th examination or its equivalent examination from a recognized Board by the Central or State Govt. For ST candidates 08th pass is required. For Naxal affected area candidates 5th class pass is enough. For Constable Tradesman: 8th class qualification is required and knowledge of respective trade is required. It is in between 18 years to 28 years as on 01st January, 2018. 5 years relaxation is there for OBC/SC/ST category candidates. It will be through Physical Measurement Test, Physical Efficiency Test and Written Examination. For Constable Tradesman Trade test will be conducted. Those who are qualified for Physical Standards tests they are only eligible for the Physical Efficiency Test. P.E.T will be conducted for 150 marks having 3 events of 400 meters running, 1500 meter running and 5000 meters running for men. And for female candidates 400 meters running, 800 meter running and 3000 meters running will be conducted. For each event 50 marks will be given based on merit in their performance. Aspirants who qualified in PET/PST test only shall be allowed to attend in written Examination. It will consist of non OMR based questions of objective type multiple choice. Question paper shall be set in Bilingual pattern i.e Hindi and English in Devnagari script. It has only one paper for 100 marks with 2 hours time duration with 100 questions from the topics of General awareness/knowledge, Knowledge of elementary mathematics, Analytical aptitude, Ability to observe & distinguish patterns, Basic knowledge in English/Hindi. It has only one paper for 100 marks with 2 parts of Part I, Part II. Part I has questions from General awareness/knowledge, Analytical aptitude, Knowledge of elementary mathematics, Ability to observe & distinguish patterns, Basic knowledge in English/Hindi. Questions of Part II will also have 50 objective type questions carrying one mark each, separately for each trade to assess the knowledge of the candidate in respective trade. Application will be submitted by aspirants directly to the Recruitment Board at recruitment centre in proper format only along with 2 passport size photographs, Matriculation certificate photo copies, date of birth proof and Domicile Certificate or Permanent Residential Certificate.